Does Miracle Fruit have any alternative names? Yes: Miracle Berry, Miracle Fruit, Synsepalum dulcificum, Frutto dei miracoli, Fruta maravillosa, Fruto milagro, Fruta de milagro, Frutamilagrosa, Sideroxylon dulcificum, Mirakelfrukten, Mirakelfrukt, Mirakelbaer, Mirakelbaer, Wunderbeere, Mirakelbes. 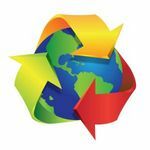 We provide tracking on all orders, EXCEPT Canadian orders. Is Miracle Fruit Safe (side effects)? Miracle Fruit Berry is safe and has no known side effects (well, lemons taste sweet!). It has been used for centuries (in Africa) and for decades in the US and Asia. In Japan, Miracle Fruit tablets have been on sale since 2006. Miracle Berry tablets are made in a pharmaceutical clean room, free of any germs or dust. They contain no artificial additives (such as colorants or preservatives). Please use Google to confirm that Miracle Fruit Berry has no known adverse side effects. We cannot guarantee your safety though and you are purchasing and using Miracle Fruit on your own risk. It depends on the type of food, the strength of the Miracle Fruit, your tastebuds, the temperature and quantity of food eaten. It could wear off in about 15 minutes or last for almost two hours. The effect wears off with hot liquids (such as coffee) or foods. Are Miracle Frooties and other Miracle Fruit tablets different? YES. 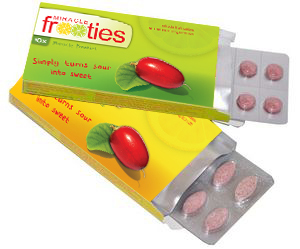 Miracle Frooties are THE ORIGINAL miracle fruit tablets. They are natural, contain no colorants or preservatives and are made according to HACCP - ISO 9001 standards (others are not!). Other differences are they have 0% fat and last longer.